My parents are getting ready to sell their house. If you can believe it, I still have some stuff in their house, including some really old roleplaying stuff. Well, I got a package with some miscellaneous stuff in it, including some of my very old D&D miniatures. 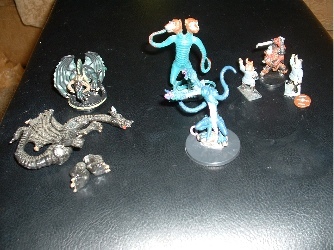 And so, without further ado, I present the c. 1980 version of a black dragon, Demogorgon, and hobgoblins, alongside their contemporary equivalents. I never could get that black dragon to hold together. May was pretty much a blur—spending two weeks of it in bed certainly contributed. I'm coming up on my 13th wedding anniversary (Monday), it's the last day of school for my son, and Origins starts in 3 weeks (I'm not going this year). So why's it still gray and rainy out? It strikes me that a truly responsible blogger would take an entry like this and split it into four or five entries, to which it would then be possible to assign relevant categories. I'd have a "Writing" category, a "Books I've Read" category, and then some "Theological Musings," a new "Site News" category, and a "Conventions" entry. Would you like to pretend that we live in such a neatly organized world? I walked into Tuesday's department meeting, and the book department art director had a copy in front of him (along with other books, including our reprint of Laurell K. Hamilton's Death of a Darklord). I was pretty excited that meeting. I called it my Precious. Then I brought it home. And now my wife is (re-)reading it. As far as I know, the official release date is still July 11. 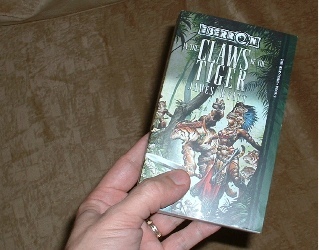 Hey, Amazon (or someone...) has decided to pair this book with Book 1 of The Belgariad. Buy them both, get 5% off. Wacky and zany, simultaneously! Last night I finished Elizabeth Kostova's The Historian, which I enjoyed a great deal. It was not exactly a fast-paced thrill ride of a book, but it was filled with likable, intelligent characters. It's not exactly a fresh take on the Dracula legend, but a very engaging immersion in it. And I had absolutely no qualms about her writing, as long as you can forgive her the deliberate pace of the 642-page book. Considering that it includes a fictional article from a historical journal, it at least reads like engaging history, not boring history. Speaking of really long books, that was something clever I said about Dean Koontz's book I read a couple of weeks ago: I felt like he had written a 150-page book, and his editor had said, "This is great, but it needs to be twice as long." 6-6-06 has come and gone. I was going to write something pithy and clever on the day, but it went by too quickly. I read a sensible article on cnn.com about the weight some people (marketers, mostly) were hanging on the date. I'm amused by the release of The Omen remake on that date, though I can't help wondering if it helped or hurt ticket sales to open on a Tuesday. (I also hear it's not a very good remake.) Nonplussed by the release of the latest Left Behind book on that date, and kinda disgusted by the release of Ann Coulter's book on that date. and we wasted it on that movie. So, you know I had issues with the book. So what does it say about the movie that I felt compelled to defend the book? Not good things, my friends. Not good things. Ian McKellen was the movie's only saving grace, and he could not buoy it from absolute suckage. You'll notice I took 'em off. They bugged me, and there was no upside. Not for a site this size, with my small but faithful bunch of readers. Say, have I mentioned that I wrote a novel?